IAN DAWSON September 7 - October 7, 2000 James Cohan Gallery is pleased to present the first U.S. exhibition of British artist Ian Dawson. Dawson creates large-scale sculptures from everyday, mass-produced plastic objects. Plastic chairs, crates, bins, buckets, hangers and tubs are transformed and reconfigured by the exposure to intense heat. 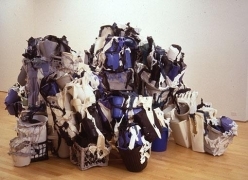 The notion of entropy is evident in the work, as Dawson asserts, "I build and destroy in one neat cycle." "There is something very physical about putting fire to a petrochemical substance and then seeing the chemical reaction. It was the weird science of seeing a molecular structure being altered before your eyes that really got me into melting," says Dawson, who completed his studies at London's Royal College of Art in 1993. For Dawson there is an ambiguous position between painting and sculpture, echoing Abstract Expressionism and the meltdown ready-made. 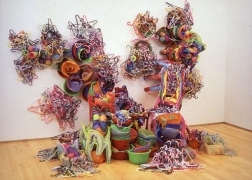 The result is often a mass of colorful, molten conglomerations that can measure seven feet high. There is a further reading of the work in its play between violence and beauty, and the apocalyptic and the lyrical. Like a Pollock drip painting, the eye is kept in constant motion. We will also exhibit several of Dawson's Spirograph drawings. Using the commercially popular toy of the late 1960s and 1970s, these large works are executed on meticulously prepared surfaces. In contrast to the sculptures these drawings, emblematic and mechanical, further exemplify Dawson's interest in structure and its dematerialization.